Sometimes I feel like I’m the Poop Fairy. My dogs poop A LOT. I always pick up after them, but sometimes it’s difficult juggling two leashes and 2 or 3 USED poop bags. This is especially entertaining (I’m sure) when someone decides to let their dog barge up to us as I’m bent over trying to pick up poop with one hand while holding two leashes in the other. Which brings me to … the PooVault. 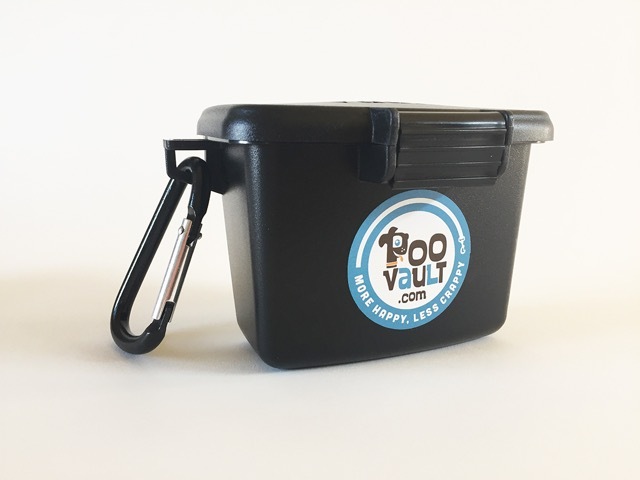 The PooVault is a hard-sided container that can hold used poop bags until you get to a trash can. It’s hands free and odor free. It traps in the odor, and it really works. It also clips to your belt loop or leash. I prefer to use the carabiner to clip it to my belt loop. This post is sponsored by PooVault. I’ve featured the PooVault on That Mutt before, and you can read my full review here: PooVault review. The PooVault is available HERE. 1. 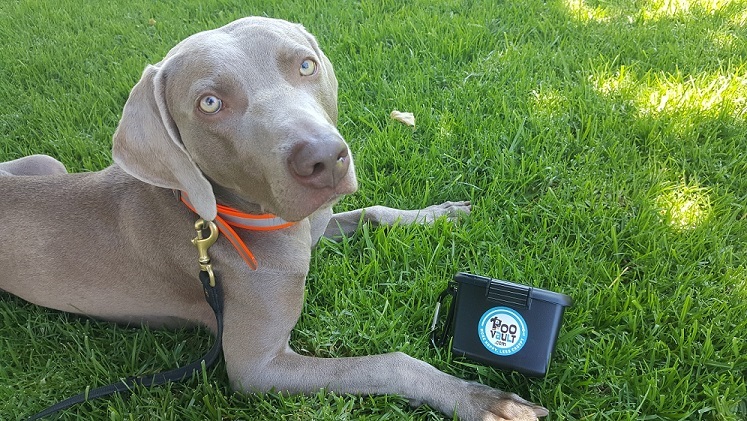 The PooVault for professional dog walkers. 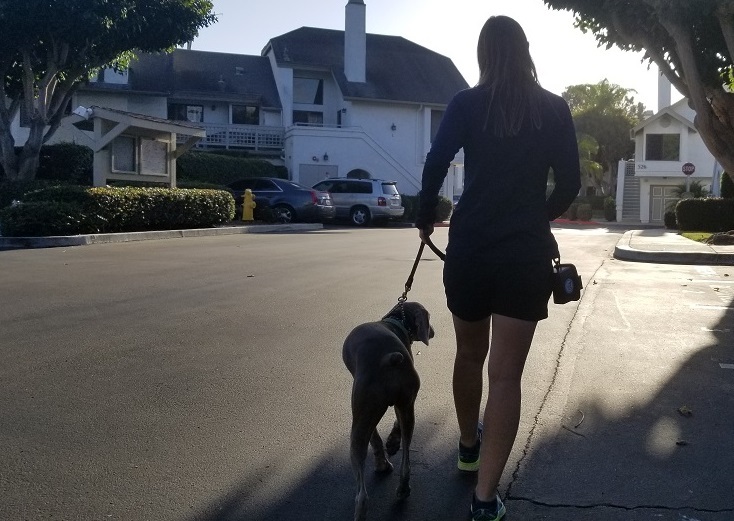 If you’re a professional dog walkers or pet sitter, you might want to consider the PooVault for certain routes or clients. 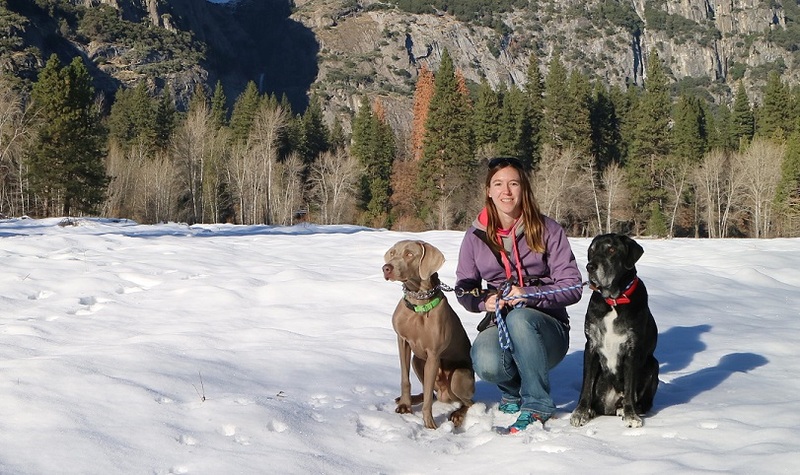 Some dogs poop more than others (Ace), and some routes have more trash bins than others. The “vault” is also nice if you know you might be stopping to chat with clients or potential clients. Nothing like shaking someone’s hand while holding a used poop bag in the other! The PooVault is more professional! Thank you, Keith and Emma Lou! 2. The PooVault for walks with no trash bins. I’m lucky to live in a very dog friendly area with trash bins and dog bag “stands” everywhere. However, there are a few parks and routes we take that don’t have as many garbage cans. 3. The PooVault for hiking in rural areas. There aren’t as many trash bins on the trails we visit compared to our urban walks. I try my best to get the dogs to “go” as soon as we get out of the car because there’s usually a trash bin there. Once on the trail, we might not see another garbage area for a couple of miles. My dog Ace moves very slowly … and poops a lot, so it’s nice to have the PooVault handy until we get to a trash bin. With a slow-moving senior, that can take quite a long time! Remember this beautiful photo we took last year in Yosemite? My dog defiled Yosemite National Park. Kind of ruins the moment, doesn’t it? Haha. 4. The PooVault for walking multiple dogs. 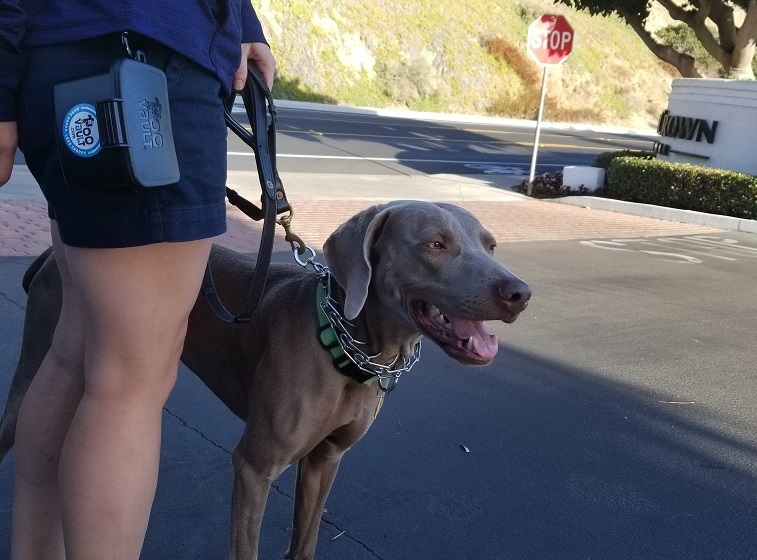 If you’re walking multiple dogs, you can only carry so many used poop bags along with your leashes. 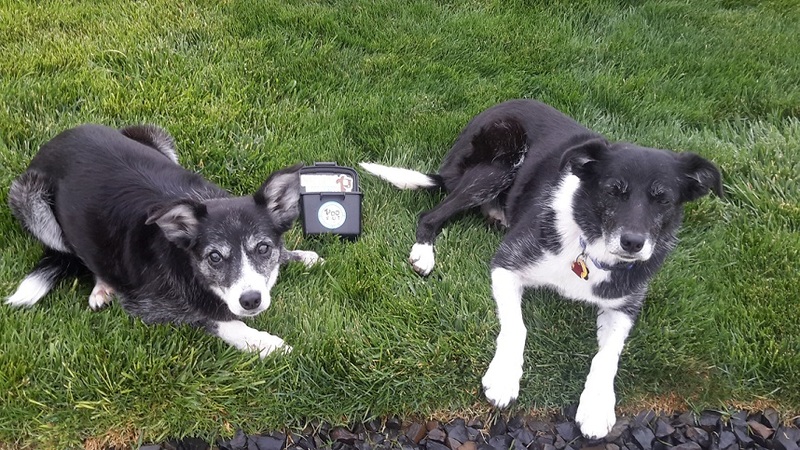 One of That Mutt’s readers, Janis, uses the PooVault for dogs Kee and Syd. Thank you Janis, Kee and Syd! A few of That Mutt’s readers commented on our last post that they’d use the PooVault for bringing in a stool sample to the vet. You know, less smelly that way! Believe it or not, but I’ve actually transferred used poop bags in the trunk of my car after a dog walk because there weren’t any trash bins where we were hiking. Call it dedication, I guess, but boy was it smelly without a PooVault! Giveaway! 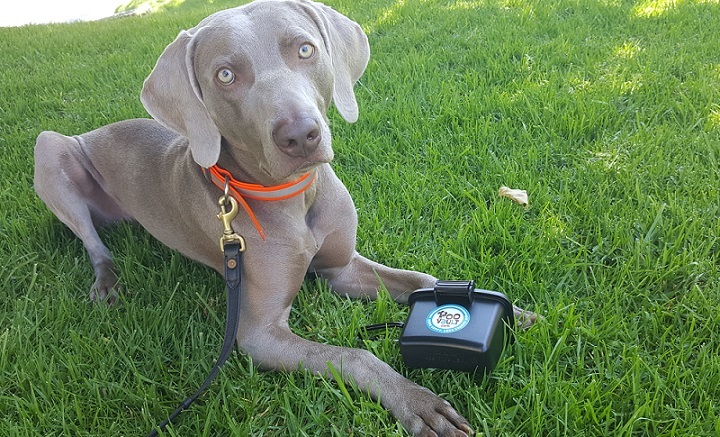 Win a PooVault for your dog! 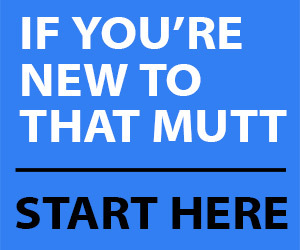 PooVault is giving away one FREE “vault” to a reader of That Mutt! *Congrats to the winner, Debbie S.! Just leave a comment below to let me know your dog wants IN on the drawing. What is your reason for wanting a PooVault? I’ll choose a winner at random on Monday Oct. 2 and notify the winner by email. Must have a U.S. mailing address to win. That Mutt’s $7/mo Patreon members are automatically entered into all giveaways. Sign up here. Are you interested in a PooVault? Please share this post with anyone who might be interested in the PooVault. Absolutely I am interested. What a great idea!! This is a great idea. There has been times that I have had to carry a bag for part of a walk. This is something all dog owners need. Sounds like a great way to avoid carrying used bags. Such an excellent idea>> I have three big girls and when we travel and stop for relief, if one goes they all go! We never stop in public places so their is no place to deposit the treasures>> this perfect plan is a game changer! Thank you for the chance to win..
Yep, I’ve done that too! This is such a great idea! I live in an urban area with easily accessible garbage cans and never realized how spoiled I am there. But, we go out to the suburbs every weekend. There I find myself carrying her poop bags for blocks on end because there is nothing near by! We have also just started hiking together and this would be a life-changer! We would love a poo vault! With 3 dogs I never seem to have an empty hand to easily carry their little presents. This would help me so much! Great idea! I feel so wrong when I wave at someone with a poop bag in my hand! (The dog is in the other)! Great article Lindsay. The number one reason I developed and use the PooVault is for limited access to trash cans, which all of you have touched upon. It is very nice not smelling dog poop! It is far easier to wait through all the bush sniffing when you aren’t disgusted by the bag. Anyhow, I love reading your comments and happy trails. Yes, just this morning I walked my two dogs together. Sure enough, even though they both pooped right before the start of the walk Ace pooped two more times during the walk! The PooVault makes our walks more relaxing. It’s a bit stressful with my young dog pulling out in front of me and my old dog dragging behind. Not having to hold two used bags in my hands makes a big difference! 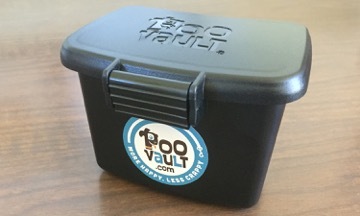 For running, the PooVault fits in my small trail running backpack. I didn’t choose the pug, life the pug life Chose me. I’m frequently using my truck to transport poo bags, as 99% of the places I walk or hike with my dog have no trash bins. This would be great. Oh gosh, I’ve had to transport bags in my car too. So gross! Haha! This would be great for long hikes! Love the idea. Hope we win! Think it would be a very useful for me & my furbaby OSO! I would love to carry one of these especially during hot weather walks! I definitely see how useful this would be for longer hikes and overnight camping adventures!! Brody would love a poop vault. He already carries his own bags and loves to help out. We would love to have a poovault.Very convenient for my embarrassed teenagers who don’t like carrying poo bags. The poovault sounds like a great idea. It is not fun carrying a plastic bag full of poo until you can find a garbage can. I could even make it home with the stuff if I had a poovault. Walking more than one dog requires this for me to have. My furry kids are in need of this product. Especially when we go to the canyons for long trips. This is definitely a great idea. I have 2 pups and we tend to find hikes that don’t even have trash cans at the trail entrance so I end up driving home with some smelly poop bags, windows wide open obviously! This would be a nose saver. Haha, I’ve done that too! I would love to win this! My dog always seems to poop at the start of our walk and I have to carry it the rest of the way! I try to get her to go before, but it never works out! yes, I need this, I went to a dog event this past wkend and had to carry around the bag of poo b/c there were no trashcans. I really needed this. How embarrassing to stop and talk to people, known or unknown, while juggling your dog and bags of poop. Poo vault would definitely help my social game! I would LOVE this!!! My dog has an issue with going potty in the yard. He always waits until we are out and about. I have started to scoop and bring it home with me to put in the yard to encourage him, but putting it in the car is pretty smelly! And I surely don’t want to encourage him to go in the car! The poovault would be great to keep it in until I get home! I dont understand why cans are not part of suburban life… I walk and walk, the only can is by the kiddies park,so i dont toss it there… It gross, so around we go waving at people with the stinky and gross duty bags… Me me please!!! I would love one of these. There are not enough trash cans where we walk!!!! Oh, gosh, yes! We have been walking Lambeau on trails and there aren’t always trash containers know the trails. We’d love this! We could definitely use a PooVault! I love Poovault. 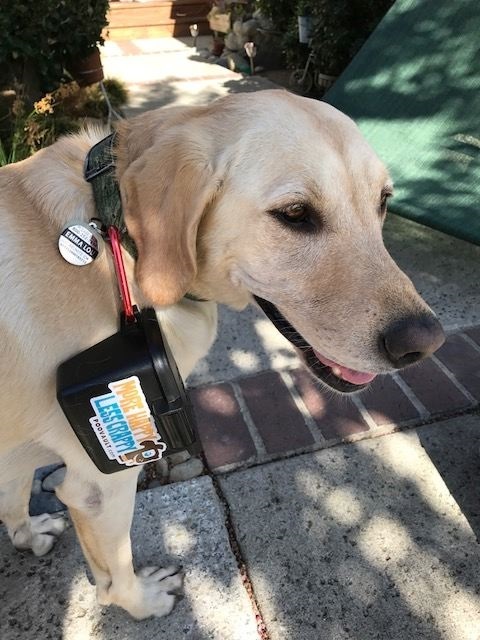 Take it with me on all walks.Keep one in the truck and one at home.Dogs go poo whenever and wherever.It saves me from having to find a trash can when I`m walking 3 or more dogs.Hands down one of the best dog products out there.If you have water and Poovault you can walk/hike with your dogs almost anywhere.